Welcome to Myrtle Beach Coupons, your online source for finding savings and discounts for your next Grand Strand vacation. Every day we receive emails from our website visitors like the one below who are looking for coupons when planning their Myrtle Beach vacations, wanting to find the best values and bargains in the area. "Our family will be visiting the Myrtle Beach area the first week in May. We know we will definitely be visiting Brookgreen Gardens and Ripley's Aquarium and eating at many of the great seafood restaurants in Murrells Inlet. If you have any coupons or savings to help us it would be wonderful. We will be looking for a motel also... Thank you!" There are coupons everywhere, and you could spend days gathering up hundreds of coupons for the different attractions, restaurants, golf courses, and everything else you want to save money on. What we recommend is the Myrtle Beach Promotions Ultimate Discount Card , which is loaded with over 300 discounts for you and your family to enjoy. This truely is the Ultimate Myrtle Beach Discount Card. 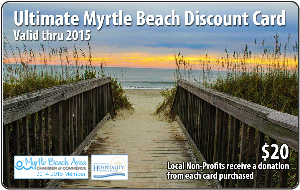 While you're around the Myrtle Beach area take advantage of the card and save money. Unlike coupon books or pre-loaded cards that offer a coupon for a one time discount, you can continue to use this card over and over again. And that is REAL VALUE. Use it at YOUR most frequented restaurants, the stores where YOU and YOUR FAMILY like to shop, and the golf courses where YOU play, and more. 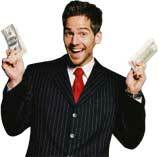 You can order your Ultimate Discount Card card from home, before your vacation, so you'll have it before you get here. On your left are some of the stores, concerts, entertainment venues, nightclubs, miniature golf courses, golf courses and restaurants that we provide coupons you can print - just click below on a category to open up a printer-friendly page that'll save your family lots of money on your favorite things to do! ©1999-2018 MyrtleBeachCoupons.com - All Rights Reserved. Reproduction prohibited.